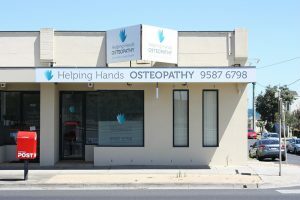 The Osteopaths working at Helping Hands Osteopathy pride themselves on providing professional and honest advice to help treat and manage your pain. They complete ongoing professional development to advise you on the latest information about treatment and management options. In Australia, osteopaths complete a five year university degree or higher (Masters), are registered with the governing body (Osteopathy Board of Australia) and are members of Osteopathy Australia (OA). At Helping Hands Osteopathy, we believe in working closely with your other health professionals including general practitioners, specialists, dentists, podiatrists, myotherapists, personal trainers and pilates instructors. Our goal is to help provide symptom relief and reduce the likelihood of your pain returning so you can achieve your full health potential. Provide excellent customer service and professional advice. Provide highly skilled practitioners who will create a unique individual treatment and management plan for relief of your pain. Always maintain our professionalism, honesty and integrity. Always be friendly and approachable. Provide a caring and nurturing environment in the clinic.